World Series: Madison Bumgarner Carries Giants To 3rd Title In 5 Years : The Two-Way Madison Bumgarner won Game 1 of this World Series, throwing seven innings and giving up one run. He won Game 5 with a complete game shutout. On Wednesday night, on two days' rest, he finished the job. San Francisco Giants pitcher Madison Bumgarner throws during the fifth inning of Game 7 of the World Series in Kansas City, Mo., on Wednesday. He was also the winning starting pitcher in Game 1 and Game 5. 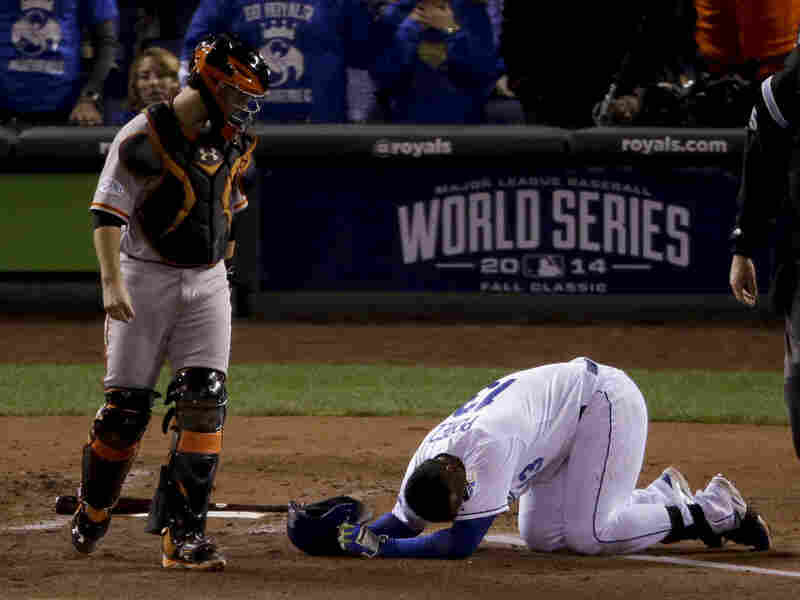 Kansas City catcher Salvador Perez lies on the ground after being hit by a pitch from San Francisco's Tim Hudson in the second inning of Game 7 on Wednesday. And on Wednesday night, completing one of the most impressive postseason pitching performances in history, he helped the team take Game 7, pitching the final five innings on two days' rest, giving up just two hits as the Giants won the game 3-2, and won the World Series. 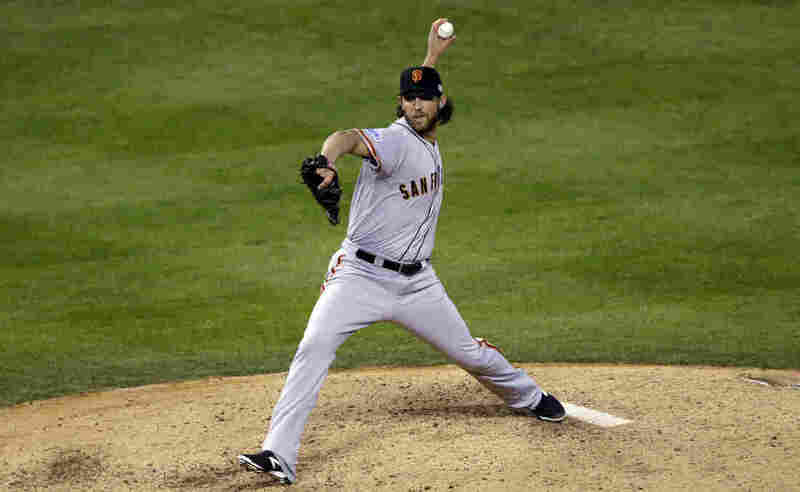 All told, he gave up just nine hits and one run in 21 innings of World Series action as the Giants won their third title in five years. He struck out 17 while walking just one Royals batter. The Associated Press notes that only Randy Johnson with the Arizona Diamondbacks in 2001 has also won three games in a World Series in recent decades. At Civic Center Plaza in San Francisco, "a mass of humanity partied on the lawns" after watching the game on a jumbo screen, The San Francisco Chronicle reports. "A New Orleans style jazz band formed after the final out and held an impromptu parade in front of the San Francisco Library and Asian Art Museum, with at least 100 people dancing along and shouting. Fans stood shoulder to shoulder screaming and cheering amid a horn-honking hootenanny outside bars in the Mission, South of Market and throughout downtown." 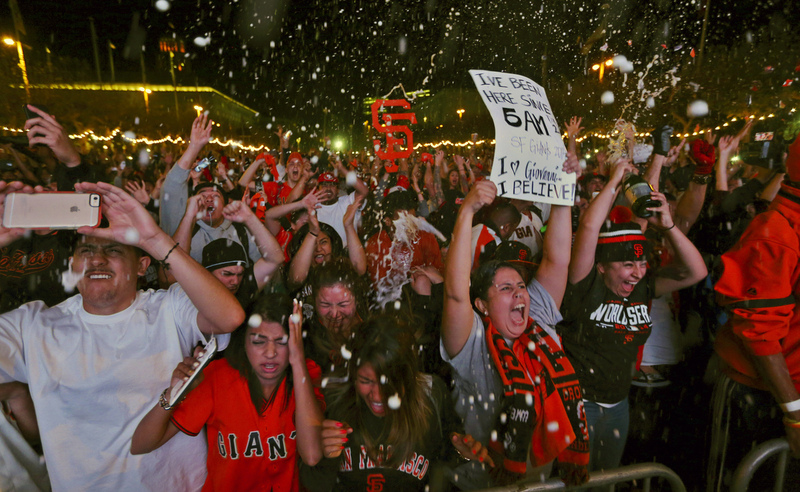 Fans celebrate the Giants' victory during a television-viewing event at the Civic Center in San Francisco. #SF waits with giant anticipation for return of World Champ #SFGiants to celebrate as one City with parade down Market Street on Friday! "They had known loneliness and they had felt despair. This lost generation of fans had been left behind and cast aside across 29 seasons without October, the most bittersweet month in baseball. They never knew the exhilaration the playoffs could provide. They never knew the exquisite torture that lurks at the roller coaster's end for every team but one. "The 2014 Kansas City Royals believed they could be the one. They believed they could lift up this city and raise it to the throne they had abdicated after 1985. The players felt it in their bones. Their manager espoused his faith daily to the public. Belief is the most beautiful armor, capable of shielding all the frailties of a baseball club, the qualities that leaked into view in a 3-2 loss to San Francisco on Wednesday night at Kauffman Stadium." Royals fans watch their team's defeat in the Power and Light District during Game 7 of the World Series on Wednesday in Kansas City, Mo. The team got a taste, but ultimately Bumgarner "crushed their dreams," the Star says. 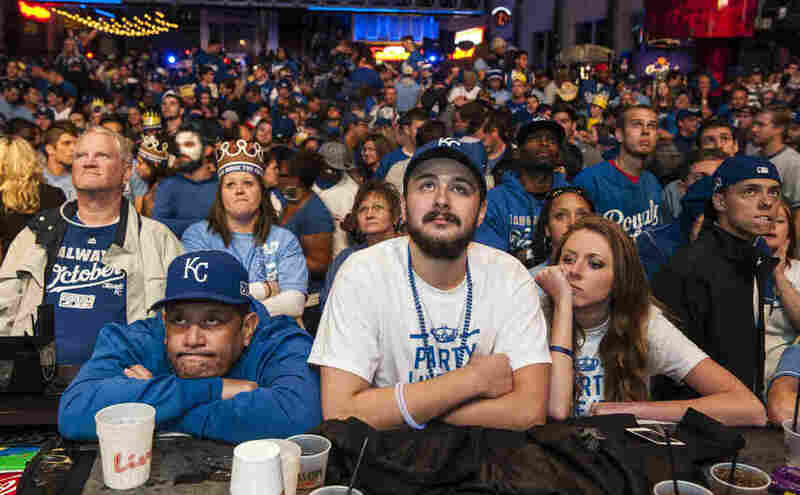 While fans in San Francisco partied in the streets, inside the Kansas City clubhouse, the paper reports, "the eyes of the Royals were either red or hollow. The room was quiet save for the sound bags being packed, noses sniffling and farewells being issued." "Crowds of partyers set bonfires and rampaged through the Mission District, South of Market area and around AT&T Park, where the Giants thrilled their fans this season. Most of the celebrants were peaceful early on, but just as in 2010 and 2012, thuggery increasingly replaced level-headed revelry as the night grew late." CBS in San Francisco says two people were shot overnight, according to police. Both are expected to survive, CBS reports. On Twitter, the city's transit service announced service changes and suspensions due to crowds and "safety concerns."